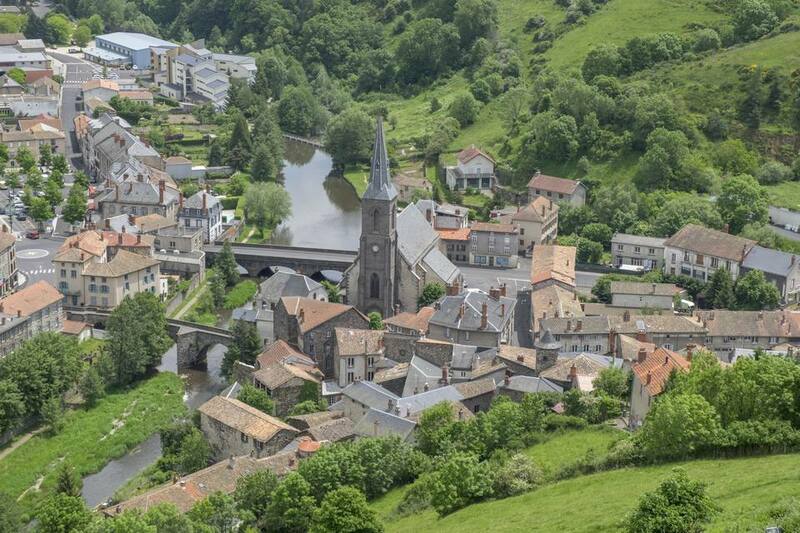 Saint-Flour is tucked between two volcanic mountain regions in the Massif Central in France in the Haute Auvergne region, offering travelers a chance to see the rural side of medieval France as well as the natural beauty of a volcanic landscape. Medieval Saint-Flour itself is perched on top of the Auvergne's highest volcanic outcrops, and the views of the surrounding countryside from the high town are spectacular. Saint-Flour is located about 225 km south of Paris on the famous free autoroute A75 that starts heading south from Clermont-Ferrand, making it an interesting stopover for the tourist heading toward the south of France - Cathar country, Nimes, or Provence. Few tourists know of the Auvergne, but there is plenty to do and lots of interesting food to eat. The town's history starts in the 4th century with the arrival of Christian evangelist Florus, who is said to have built a small chapel at the peak of the outcrop. In the medieval period, Saint-Flour rivaled Aurillac as the capital of the Auvergne because of its advantageous position on the trade routes. In Saint-Flour you'll find hearty, regional dishes (no part of the animal is wasted) like Tripoux, a stew of tripe and sheep feet tied in parcels, Aligot, mashed potato smooshed with cantal cheese and garlic often served with sausages, and the tiny green lentils from Le Puy to the east, grown on volcanic soil. Cheeses include Cantal and the famous Bleu d'Auvergne. The mountain air makes good, cured ham, and mountain pork dishes are popular. When you drive up to the high town, there will be a parking lot directly at the top, in front of the Grand Hotel de L'Europe. It's reasonable, although the elegance is rather faded. Spring for a room with a view. Saint-Flour is a great little village to walk around. You'll see expertise in working the black basalt found in this volcanic region, and the streets in summer feature many festivals. Traditional markets are held on Tuesday and Saturday mornings. The Cathedral of St. Pierre - A fortress-like church made of black basalt with its life-sized wooden black Christ statue. Guided tours of the Cathedral and South Tower are possible. Musee de la Haute-Auvergne - You'll find this interesting museum next to the Cathedral in a former 17th-century Bishop's Palace. The museum has everything from archaeological artifacts dating from the Neolithic Age to exhibitions on Chimneys of the 15th century, tools for cheese making and the evolution of the popular furniture in the Haute-Auvergne to name a few. Musée d’Art et d’Histoire Alfred Douët - Behind the Renaissance façade you'll get your fill of paintings, sculptures, tapestries, arms, and crockery of the region. Musée Postal d’Auvergne (Postal Museum) - Get the scoop on postal history from the 18th to the 21st centuries. The Rando Philo of the Pays de Saint-Flour - Hikes with "philosophical encounters" are held every Sunday in May. There are lots of hiking, mountain biking, and horse trails in the Mastif Central, of course, but one fascinating side trip west of Clermont-Ferrand is to Vulcania, a park devoted to the 80 extinct volcanoes of the area featuring a descent inside a crater. You'll want to spend 6-8 hours exploring it all. The viaduct of Millau, recently completed and the tallest viaduct in the world is the Route 75 bypass of Millau between Clermont-Ferrand and Beziers. Quite an engineering feat, two people have been added to the staff of the Millau Tourism Office just to answer questions about it.